I sometimes find myself wondering what it must have been like for Mary to be confronted by the angel Gabriel—to be going about daily life when the divine suddenly breaks in on the ordinary so clearly and undeniably. Here the supernatural trespasses on the natural in an unexpected, indeed, unexpectable way: an angel appears with a message from God Himself. This isn’t your typical Sunday School Christmas Program angel, either—a cute little kid in an oversized gown, white wings, and a droopy halo. We tend to imagine angels in that sort of Precious Moments style, but the reality is far different. You need only read Revelation to understand that. There we read of angels holding back the winds, blowing trumpets, and speaking with the roar of a lion. We hear of Michael and the other angels waging war against Satan and his demons. This depiction of angels is not one we tend to think of—angels strong and powerful. We can understand, then, why when an angel appears to St. John later in the book, he falls before it. He is so overcome, the angel has to stop St. John from worshipping it. The upshot of it all is this: angels are otherworldly creatures, and when they appear in their glory, it can be an overpowering experience. Indeed, we read in Scripture that Mary is “greatly troubled” when she first hears Gabriel’s greeting, wondering what his words—“Greetings, you who are highly favored! The Lord is with you”—could mean. There’s a reason that Gabriel here and angels elsewhere in Scripture quickly comfort their audience with words of assurance: “Do not be afraid.” When an angel appears to you, fear would be a very natural response indeed. There’s a reason that Gabriel here and angels elsewhere in Scripture quickly comfort their audience with words of assurance: “Do not be afraid.” When an angel appears to you, fear would be a very natural response indeed. But how does Mary respond to Gabriel’s message, the message that she is to bear the Son of the Most High? She merely asks one question, and a fairly understandable one at that: how is she to bear this child since she is still a virgin? 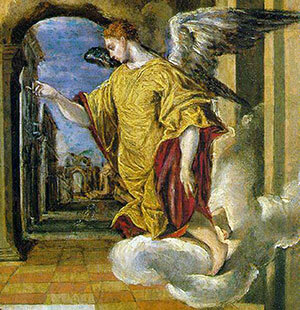 When Gabriel explains it will be through the power of the Holy Spirit, Mary immediately acquiesces to the divine will. “I am the Lord’s servant,” she says. “May it be to me as you have said.” What great faith! What great humility! Compare Mary’s response to that of Moses at the burning bush. There God tells him he has been chosen to lead the Israelites out of Egypt. Moses makes excuse after excuse in an attempt to get God to change his mind. When that doesn’t work, he bluntly says he doesn’t want the job. “O Lord,” he says, “please send someone else to do it.” This despite the fact that Moses had been given the ability to do signs and wonders to prove he really was sent by God! 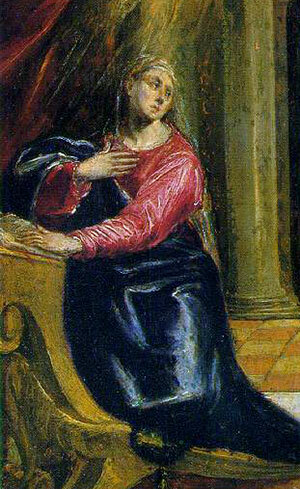 Mary, by contrast, is given no such power; she has no miracles with which to convince others that her story is true. Moreover, she must have known the danger she faced: she and Joseph had not consummated their marriage. She could, therefore, be charged with adultery; and the punishment for that was death. Indeed, we know that Joseph doubted her story, though being a righteous man he intended to divorce her quietly—something he would have done but for an angel’s intervention. Mary must have foreseen these possibilities—divorce or even death—even as she accepted God’s will for her. 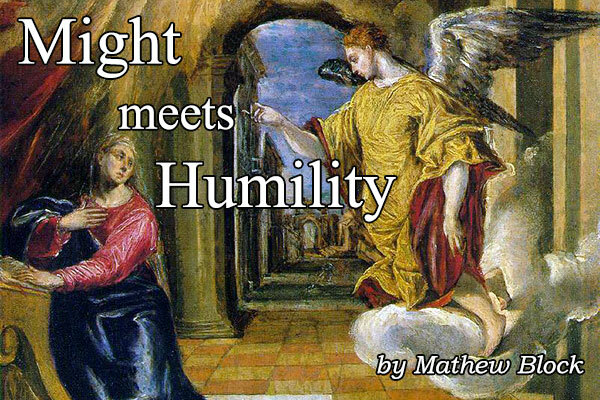 It demonstrates great trust on her part to have said yes—a measure of humility before God which we would all do well to learn from. Here one mightier than Gabriel is entering into the story. Here is One humbler than Mary, taking on a servitude greater than even hers. At Christmas, the All-Mighty became the Most-Lowly for us. And His earthly journey would see Him stoop even lower still. Falling beneath the weight of a cross. Falling beneath the weight of the sins of the world. But three days after His death, He rose again in glory! And He who stooped once so low to be with us will lift us up with Him in the last day, when we enter into His eternal Kingdom. And there we will with the angels and Mary, with the prophets and the apostles, and with all believers worship God in His glory forever! Mathew Block is Editor of The Canadian Lutheran and Communications Manager for Lutheran Church–Canada. He also serves as Editor for the International Lutheran Council and blogs with First Things.